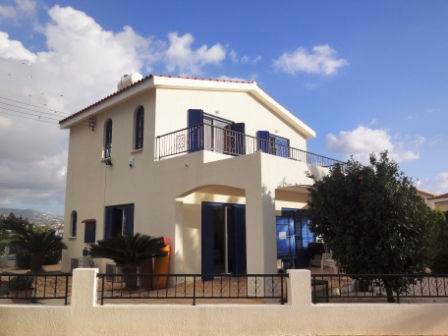 Cyprus Property Blog by Cleo : Coral Bay Villa - Paphos - Great Reduced Price! Coral Bay, Paphos - Situated on a large corner plot, this spacious 4 bedroom villa is located in a quiet residential cul-de-sac in the sought after area of Coral Bay. The beach is a few minutes’ walk away, together with a wide variety of amenities - restaurants, shops, bank, etc. The layout of the accommodation has been individually designed by the current owners to suit their family requirements. The downstairs living area has attractive arches leading from the large entrance foyer to the spacious kitchen/dining room, and also to the separate lounge area with it's wood burner style gas fire. So, although still open plan, the areas are more separated and distinct. The kitchen is a real family kitchen with a utility area at one end and plenty of room for a large dining table. Next to this is the fourth bedroom which is currently being used as a study, and there is a guest cloakroom situated off the entrance foyer. Upstairs, there are 3 further bedrooms, all with fitted wardrobes. The master, with its character arched windows, has a good size en-suite shower room, and there is a family bathroom off the central landing. Both the master and second bedroom have patio doors opening onto a balcony with lovely mountain views. Outside there is plenty of space for entertaining and relaxing. Off the lounge and study/4th bedroom is a large covered balcony and at the rear of the property is an impressive decking area beside the solar heated swimming pool. The surrounding landscaped gardens include mature hedges providing privacy to this area. The property is being offered part furnished and has full title deeds. It has been a permanent home for the current owners and is ideal for residential living, or as a wonderful holiday home. A state of the art alarm system is installed.